The Official Ishihara Color Blindness Test developed for color vision testing. Unlike the Ishihara patterns that may be found online and viewed over a computer monitor, this color vision test is designed to produce accurate test results in determining color blindness and the degree of color blindness. 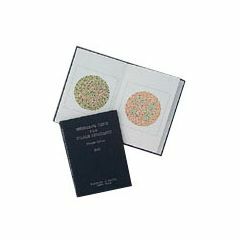 Since color reproduction may vary from computer monitor-to-computer monitor, the best and most accurate method of testing for color blindness still comes from official Ishihara album-type books. Unless the computer monitor display administering the test is capable of CRT ICC calibration and regularly degaussed and recalibrated, accurate color and test results may not be possible. Additionally, home printed versions of the test may yield inaccurate results due to variation in ink cartridge color. Printing of Ishihara color tests should only be done on imaging devices accurately calibrated to CMYK or Pantone color charts. ( saturation or depth of color ) as a normal observer. It is said that Males, in general, experience color blindness at the rate of 12 in 100 while color blind females reportedly test at a rate of 1 in 200. With this color blindness test, you will be able to test for not only Protanomaly and Deuteranomaly, but Dichromasy, Protanopia and Deuteranopia. Testing for color blindness is important. The responsibility of a mis-diagnosis should not be taken lightly. Ensure accurate test results by only using quality testing products. This professional color blindness test includes four special plates for tests to determine the kind and degree of defect in color vision. Color plates are encased in specially designed album-type books for ease of handling. Additional test plates can be purchased to enhance the comprehensiveness of the test. Choose the 10 plate Color Blindness test for basic testing of adults, children and developmentally disabled individuals. The designs and shapes enable simplified testing of children and those with cognitive conditions where identification of numbers may not be possible. The 10 plate test does not contain any numbers. Flimsy little book that will probably not last. Small pages/pictures - not what is found in professional physician tests. No better than the online versions that are MUCH cheaper. Overall, an overpriced waste of money. On hire for lab. On hire for nursing. Infection Control. Team Member Health. I use the plates to check nursing and laboratory staff for colorblindness. We train students for the medical prfession and this product is great for showing them what they will really see out in the field, and the how it will help their patients. WE HAVE AN OPTEC 5000P VISION TESTER. CAN I GET AN ISHIHARA COLOR TEST SLIDE TO FIT OUR TESTER? WE WANT IT FOR FAA TESTING. is there more than one versioin of the Ishihara test? HOW TO PURCHASE a ISHIHARA COLOR BLINDNESS test ?